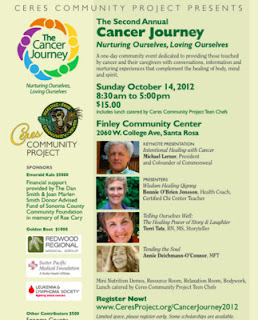 As I mentioned last week, I am participating in the Ceres Cancer Journey event this Sunday in Santa Rosa. I will be in the resource room, and for some of the time, I will be doing a short cooking demo. 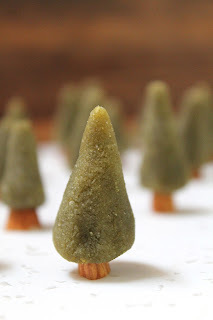 I will be making these little "healing trees", a recipe that I developed myself. They are made with green tea, almonds, dates, ginger, and lemon. I'll post the recipe here next week after the demo. The healing qualities of these bite-size morsels include: the green tea has excellent anti-cancer properties and is high in anti-oxidants; the ginger and dates both help to settle the stomach and calm digestive issues; the lemon is a great source of anti-oxidants, vitamins and minerals; and the almonds are a good source of easily digestible fiber, vitamins and minerals. AND the cute shape of the trees lifts your spirits! I hope if you are in the area that you will call by for the event and hear some wonderful speakers and experience nurturing, love and good food. If you attend, do come and find me in the resource room.